PERCOL GeoFlo Rapid Asphalt Repair Slurry is supplied in five gallon kits for reconstruction of deteriorated asphalt with NO ASPHALT REMOVAL Suitable for narrow or wide cracks, alligatoring, and small pot-holes. Repairs support load, restore aggregate interlock, improve ride, and blend in visually with surrounding pavement. A thin coat fuels and water proofs asphalt. 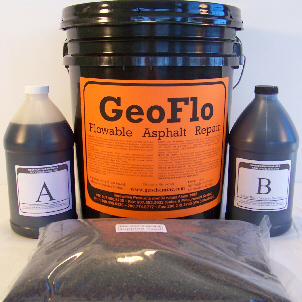 Percol GeoFlo Asphalt Repair Kit Includes Everything You Need To Complete Your Asphalt Repair. Simple Application: No special tools or equipment are needed and repairs can be completed in 5 minutes. Durable Long Lasting Repairs: Strong repairs can be done without dig-outs, restoring aggregate interlock and pavement strength with a 5+ year life expectancy. Seals & Waterproofs: GeoFlo resists damage from water and vehicle fluids. Increased Safety with Minimal Traffic Delays: Fume-free polymers require closure of only the affected lane, and repairs can be completed at any time, day or night. Unaffected by temperatures: GeoFlo will not soften or track in hot weather and is not susceptible to frost/thaw cycles. Repairs Precisely to Grade: It provides a smooth, high-traction surface.